Like movies that are so bad they are good, today’s Nice Price or Crack Pipe Pontiac Aztek is a car whose time may finally be at hand. Let’s find out if this camper-equipped Pontiac’s price deserves a round of applause. There’s an BMW 528e that I see on my daily commute that looks to be just like the nicely appointed 1988 edition we considered yesterday. Unlike yesterday’s Bimmer, the one I acknowledge on my weekday drive isn’t for sale, but I often wonder, if it were, how much might it go for? Well, I needn’t wonder any longer since the one that is up for grabs came with a price of $2,750, and fully 90 percent of you gave that a Nice Price. win. Good thing for me it’s across the country. I have enough old cars already clogging my driveway and filling my garage. You know, for a car guy or girl, having a garage is a blessing. It’s a warehouse for cars and tools and provides a weather-safe environment to work on the former while employing the latter. It’s also a place where you could hide your shame, and that brings us to today’s 2003 Pontiac Aztek which is described as having been garage kept for most of its life. Now, those of you unfamiliar with the Aztek may be looking at this car and wondering just what the hell is going on. Yes, it’s that weird and yes, this is the car that killed Pontiac. Okay so it didn’t really kill Pontiac. It did however become something of an icon for what not to do when styling a car. Perhaps not since the Edsel has an American car’s looks been so polarizing, so much so as to become a punchline to some sick joke. 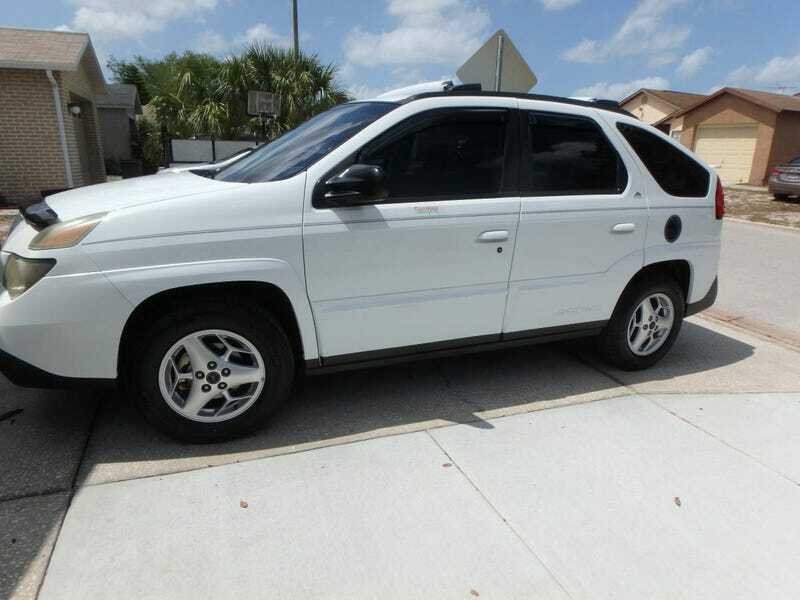 Pontiac first sprung the Aztek on the world in 2001, intending it to be a fun and funky crossover… um, thing. The awkward styling was threatened by a slightly less freakish concept, with the final eyeball threatening production version making its debut at the 2000 Detroit Auto Show. The car’s weird styling was overseen by GM Exterior Design Team lead, Tom Peters, who would go on to lead the look of the Camaro rebirth and the C6 and 7 Corvettes. Yeah, he’s still having to live the down the Pontiac, though. The car was advertised as being “Quite possibly the most versatile vehicle on the planet” and was ironically tied as a marketing ploy to the debut of the TV show Survivor. While Survivor is somehow still chugging away, the same can’t be said for the Aztek, which wouldn’t last more than five model years. This 2003 edition comes as a survivor and it also comes with all the kit, so if you’re seeking to Walter White up your life, this might be the one to get. Unfortunately, this Aztek comes after the emergency refresh that saw most of the dark grey and textured lower panels smoothed out and painted body color. The original ones are spectacularly unattractive. These ones are just… I don’t know, odd? Our candidate is painted in Summit White and rides on factory alloy wheels with two-year old Michelins for rubber. The bodywork is all intact and seems without issue other than being in the shape of an Aztek. Aftermarket plastic adorns the windows and keeps the bugs off the hood, but otherwise it looks all factory. The front lights—headlamps and corner-capping turn signals are all cloudy and need to be un-schmutzed. The interior is a panoply of angles, textures, grab bars and nets. It’s a bit disorienting at first. The car comes with all the Aztek accoutrements—drop down tail gate with cup holders for tailgating, cargo nets for cargoing, and camouflage upholstery accents because why the hell not. The big deal here however, is the inclusion of the optional center console ice chest AND hatch-mounted tent with air mattress and awning. Yes, this white Aztek is the white whale of Aztek lovers—both of them. Mechanically, the car comes with 150K on the clock and a 185 horsepower from the 3.4-litre V6 making those miles under the hood. Transmission duties are handled by GM’s corporate 4T65-E 4-speed automatic. This was the only drivetrain available in the Aztek, so stop yer whining. The ad doesn’t give any information about the car’s condition, choosing instead to focus its effort on the list of features—18 gallon fuel tank!—and the dates when minor consumables were replaced. It also doesn’t go into the model’s sordid history or what compelled the car’s single owner to hold onto it this long. Whatever the reason, it’s now being offered at $6,000, which, if you’re an aficionado of the marque will recognize as being at the top of Aztek pricing spectrum at the moment. Pontiac built about 120,000 Azteks over the course of the model’s run, and it seems like about half of those are now on the classifieds with blown head gaskets or some other annoying malady. This one seems intact and without issue other than those headlights and the fact that it’s an Aztek. The question is: could you see past both of those issues and see you way towards paying that $6,000 asking? Tampa Bay, FL Craigslist, or go here if the ad disappears. At $2,750, Could This 1988 BMW 528e Be Your Entry Into the BMW Brotherhood? Nice Price Or Crack Pipe: GM Heritage Collection Supercharged Aztek SEMA Car For $24,900?